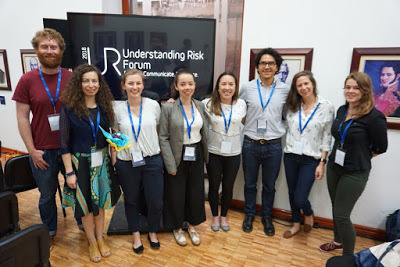 Anna Hicks (British Geological Survey) and BUFI Student (University of Bristol) Jim Whiteley reflect on their experiences as a coach and participant of a NERC-supported risk communication ‘pressure cooker’, held in Mexico City in May. ‘Mexico City in May?’ Sounds great! ‘Interdisciplinary risk communication?’ Very à la mode! ‘The World Bank?’ How prestigious! As a PhD student using geophysics to monitor landslides at risk of failure, communicating that risk to non-scientists isn’t something I am forced to think about too often. This is paradoxical, as the risk posed by these devastating natural hazards is the raison d'être for my research. As a geologist and geophysicist, I collect numerical data from soil and rocks, and try to work out what this tells us about how, or when, a landslide might move. Making sense of those numbers is difficult enough as it is (three and a half years’ worth of difficult to be precise) but the idea of having to take responsibility for, and explain how my research might actually benefit real people in the real world? Now that’s a daunting prospect to confront. However, confront that prospect is exactly what I found myself doing at the Interdisciplinary Pressure Cooker on Risk Communication in May this year. The forty-odd group of attendees to the pressure cooker were divided in to teams; our team was made up of people working or studying in a staggeringly wide range of areas: overseas development in Africa, government policy in the US, town and city planning in Mexico and Argentina, disaster risk reduction (DRR) in Colombia, and of course, yours truly, the geophysicist looking at landslides in Yorkshire. One hour before the 4am deadline. The possible issues to be discussed were as broad as overfishing, seasonal storms, population relocation and flooding. My fears were alleviated slightly, when I found that our team was going to be looking at hazards related to ground subsidence and cracking. Easy! I thought smugly. Rocks and cracks, the geologists’ proverbial bread and butter! We’ll have this wrapped up by lunchtime! But what was the task? Develop a risk communication strategy, and devise an effective approach to implementing this strategy, which should be aimed at a vulnerable target group living in the district of Iztapalapa in Mexico City, a district of 1.8 million people. Right. It was around this time I realised that I glossed over the most imperative part of the email that had been sent around so many months before: ‘Pressure Cooker’. It meant exactly what it said on the tin; a high-pressure environment in which something, in this case a ‘risk communication strategy’ needed to be cooked-up quickly. Twenty-four hours quickly in fact. There would be a brief break circa 4am when our reports would be submitted, and then presentations were to be made to the judges at 9am the following morning. I checked the time. Ten past nine in the morning. The clock was ticking. Pressure cooker? Very much check. ‘The World Bank?’ This isn’t going to be your normal academic conference! ‘Pressure Cooker?’ How on earth am I going to stay awake, let alone maintain good ‘coaching skills’?! 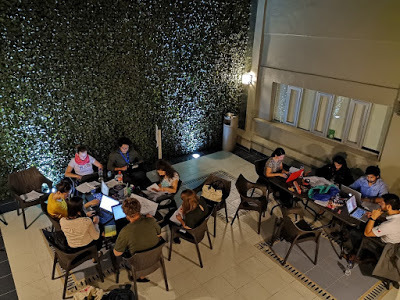 As an interdisciplinary researcher working mainly in risk communication and disaster risk reduction, I was extremely conscious of the challenges of generating risk communication products – and doing it in 24 hours? Whoa. There is a significant lack of evidence-based research about ‘what works’ in risk communication for DRR, and I knew from my own research that it was important to include the intended audience in the process of generating risk communication ‘products’. I need not have worried though. We had support from in-country experts that knew every inch of the context, so we felt confident we could make our process and product relevant and salient for the intended audience. This in part was also down to the good relationships we quickly formed in our team, crafted from patience, desire and ability to listen to each other, and for an unwavering enthusiasm for the task! So we worked through the day and night on our ‘product’ – a community based risk communication strategy aimed at women in Iztapalapa with the aim of fostering a community of practice through ‘train the trainer’ workshops and the integration of art and science to identify and monitor ground cracking in the area. The following morning, after only a few hours’ sleep, the team delivered their presentation to fellow pressure-cooker participants, conference attendees, and importantly, representatives of the community groups and emergency management teams in the geographical areas in which our task was focused. The team did so well and presented their work with confidence, clarity and – bags of the one thing that got us through the whole pressure cooker – good humour. It was such a pleasure to be part of this fantastic event and meet such inspiring people, but the icing on the cake was being awarded ‘Best Interdisciplinary Team’ at the awards ceremony that evening. ‘Ding’! Dinner served. This blog has been reposted with kind permission from James Whiteley. View the original blog on BGS Geoblogy. This blog was written by James Whiteley, a geophysicist and geologist at University of Bristol, hosted by British Geological Survey and Anna Hicks from the British Geologial Survey. The Paris Agreement – where are we now?